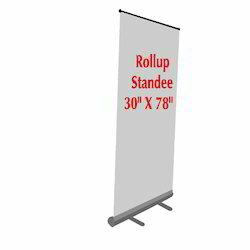 Roll up standee size 2.5x5, 3x6 in alluminium pipe with bag packing. -Rates may vary as per customer requirement. Our domain expertise supports us in designing and developing exceptional Roll Up Standee, which is an ideal solution for advertising & marketing. Creatively designed, these defect free standees are created to be used in even compact space for making an effective statement about the organization and its offerings. 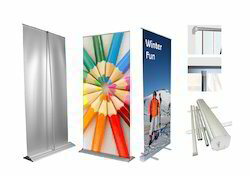 We are the leading organization in the industry to provide our clients the best quality array of Flex Roll Up Standee Board.